The NASC has re-joined the Access Industry Forum (AIF) – the UK’s leading platform for principal trade bodies and federations in the work at height sector, with effect from 1 July 2016. NASC MD Robin James commented: “We are extremely pleased to be re-joining the Access Industry Forum. NASC, and CISRS (the UK scaffolding industry training scheme) will contribute a great deal to industry debate and discussion within AIF, and will bring a wealth of expertise in terms of the work at height agenda and training in the access sector. 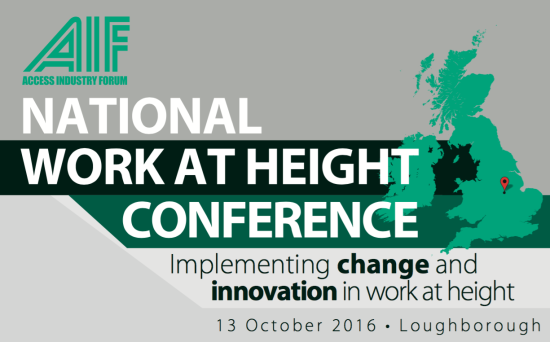 The first project with which NASC will be associated upon re-joining will be the AIF Conference ‘Implementing Change and Innovation in Work at Height’. The event will take place on Thursday 13 October 2016 at Holywell Park Conference Centre, Loughborough. A range of industry speakers and experts will be considering all aspects of the work at height industry, ranging from the implications of Brexit to the use of drones for access design. The event is supported by APS, HAE and the IIRSM, and the keynote speaker will be Philip White, HSE Head of Operational Policy and Strategy. The Access Industry Forum (AIF) is the principal forum for UK trade bodies involved in the work at height sector. Each member organisation within AIF represents a different discipline within the access industry, and the group fosters and supports good industry practice, high standards of training and equipment, and the dissemination of industry information and knowledge.